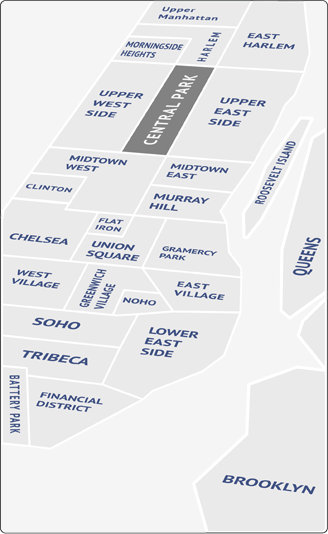 The Lower East Side (LES) extends from East Houston Street, past to Canal Street (including Chinatown and Little Italy), from the Bowery to the East River. The neighborhood began as a magnet for immigrants, and the influence of these groups is still a major presence here. The LES includes the largest Chinatown in the country, and a thriving Latino and orthodox Jewish population. In the last decade, it has attracted a younger crowd, brought in by the cheap rents. These newbies have transformed the neighborhood into an interesting blend of hip shops and bars with 50-year-old pickle shops. This is a vibrant community of different cultures, with waves of young people moving in every month. The apartments in the area consist of walk-up tenement buildings and co-ops located close to the East River. With lots of new conversions and turnover of old rent-controlled spaces, the Lower East Side has some of the best bargains in Manhattan. Despite the rush of new competition, old world favorites like Gertel's Bake Shop on Second Avenue, Guss's Pickles on Essex, and Kossar's Bialy's on Grand are all thriving. Schiller’s and WD50 represent the vanguard of hip new eateries flooding the area. And any time you want dim sum, Chinatown is just outside your door. The younger crowd spends its nights at rec room-themed bars like Welcome to the Johnsons. There’s an abundance of theater space in this sprawling neighborhood, making it an ideal host for the annual Fringe Festival, a showcase of u-and-coming stage talent. The Garment District on Orchard Street is still the place to go for cheap clothes, or you can browse Ludlow Street’s boutiques if your taste in duds is more adventurous. As you would expect from its mixed population, the Lower East Side has a little something for everyone. The Lower East Side has an abundance of open air. East River Park, stretch of greenery along the river, features bike paths, playgrounds, soccer and baseball fields, even an amphitheater with a band shell! A jaunt across the newly-renovated Williamsburg Bridge footpath makes for a pleasant weekend walk, and there are numerous playgrounds and tree-lined squares throughout the neighborhood. The influx of young blood will continue and accelerate, transforming the neighborhood further into the hip place to be in Manhattan.